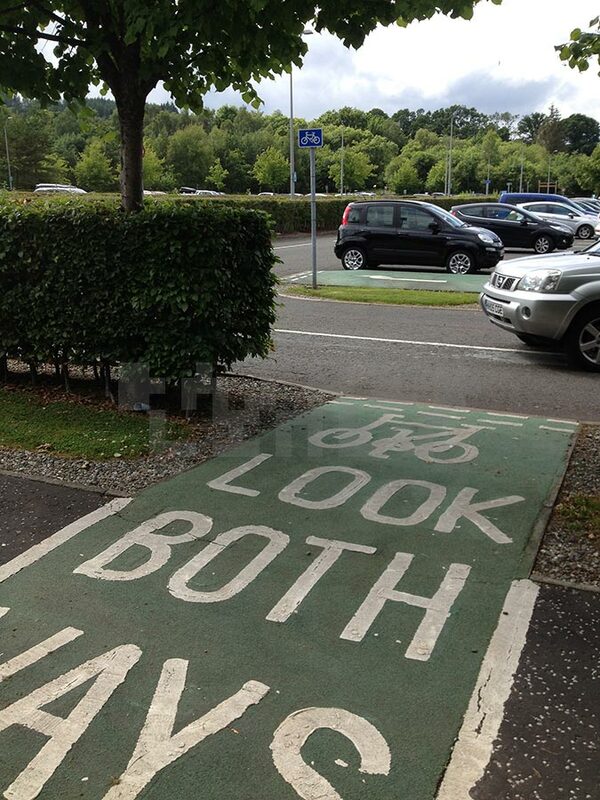 Using cycle routes in most parts of Scotland, you quickly discover one issue – inconsistency. There’s a wide variety: paths shared with pedestrians, separate paths, painted lanes on the road, bus lanes or no lane at all. Each can have different widths, surfaces and visibility. Too often, the point where a route changes will put someone riding a bike into conflict with people on foot or in cars. On less busy routes this can be irritating but not too much of a hazard. However, on busier roads a badly designed lane can put you in harm’s way. Cycling infrastructure in the UK has roots in the 1930s. However, generations of planners have done very little of it or none at all. Many cycle routes look like the person who planned it hadn’t had much practice – because they probably haven’t! The same goes for many of the road workers who put in the facilities. They can struggle to even paint a bicycle on the ground let alone do anything else. Cycling by Design cover – she’s cycling the wrong way down a one way street! However, at other times the issue is actually the guidelines used by councils (and other agencies). The Scottish guidelines, Cycling by Design, are written by Transport Scotland who are more used to designing motorways and trunk roads. The document has some good practice in it but it aims fairly low – things like minimum widths are quite narrow. These weaknesses lead to a lot of mediocre cycle routes and some dangerous ones. Many cycling campaigners want Cycling by Design to be improved. Pedal on Parliament‘s manifesto calls for it to be “revised in line with best practice internationally – particularly drawing on the experience of the Netherlands”. The Dutch don’t do half measures when it comes to infrastructure. Seeing it explained on David Hembrow’s excellent blog A View from the Cycle Path was a real eye-opener for many of us. The good news is that a review of Cycling by Design seems to be starting. What better time to collect together some gems from the west of Scotland to illustrate the point? One of the most blatant bits of bad design actually masked a deeper issue. In 2015, the bus shelters on ‘Clyde Gateway’ (A728) got their 15 minutes of fame. The photo was taken on July 17th, when this one was being built (no glass in the shelter at that stage). The white lines show the eastbound ‘cycleway’ on the pavement with the new bus shelter plonked right in its path. I call these ‘Acme shelters’ after the company in the Roadrunner/Wile E Coyote cartoons. 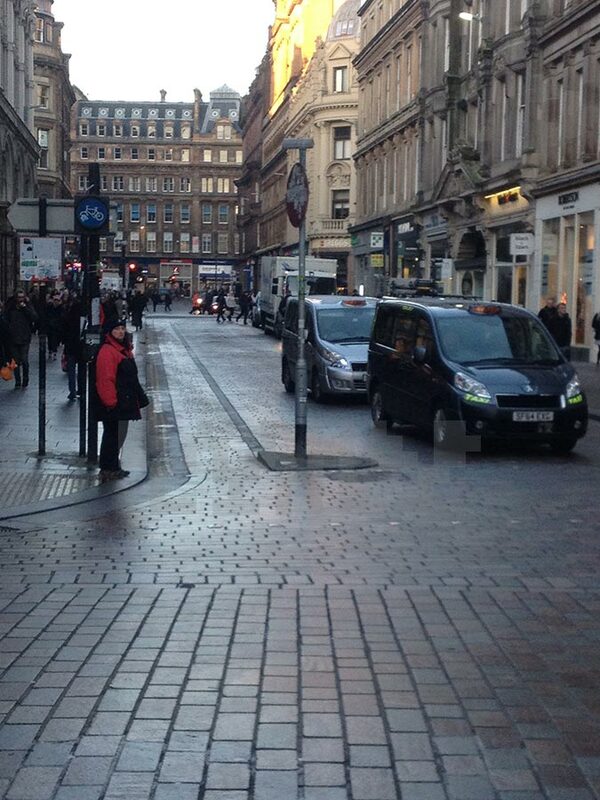 Glasgow City Council did get the lanes repainted with mixed results. 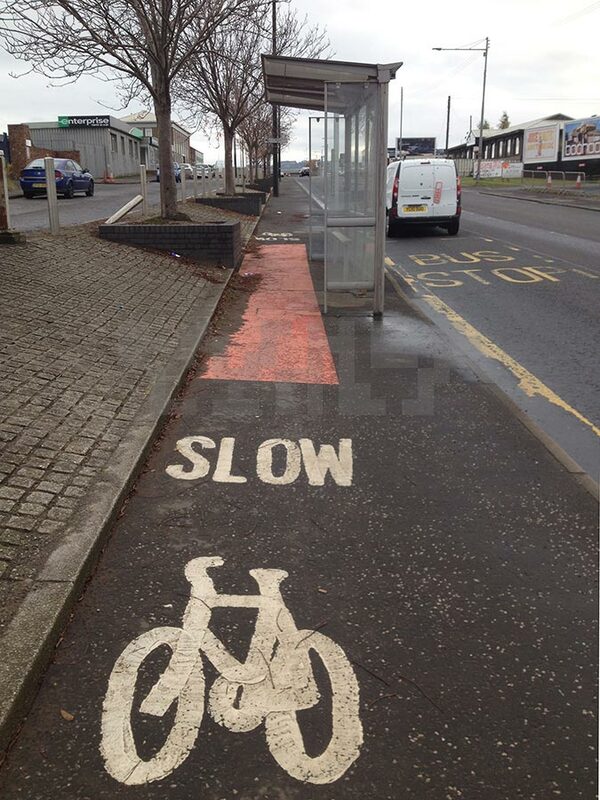 To be fair, Glasgow does have better examples of putting bike paths behind bus shelters (bus stop bypasses). Shields Road on the South West City Way is one example. Hopefully we get more of those and less of the above. If you go a few metres further on from the bus stop you find an issue that didn’t get any coverage. The bike lane goes down a ramp then ahead through a road junction. In the photo you can just see someone cycling straight on and a car that’s turned left across the bike lane. It might not look like much but if a driver moves up on someone while they’re going down the ramp then they may not be looking out for bikes on the road. If a driver doesn’t see a rider in their door mirror blind spot, then they could cut across them and knock them down. This type of accident is so common in the UK it has its own name – a ‘left hook’. Often, it’s followed by another fairly common term – SMIDSY: Sorry Mate, I Didn’t See You. Glasgow Road, Rutherglen – breathe in, everyone! I can’t talk about bus shelters without showing a classic by South Lanarkshire Council – it’s just over the river from the above. 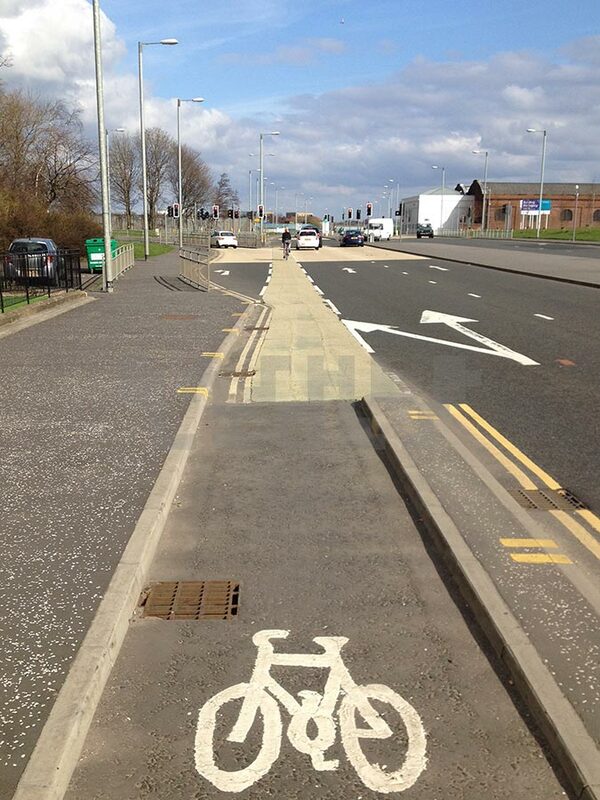 Head down Glasgow Road towards Rutherglen and you see this interpretation of a shared path. Obviously, there’s not much room if someone cycles past while anyone is waiting at the bus stop. It also pushes people walking on the pavement into the path of bikes. Slippery leaves just add to the fun although, to be fair, the shelter roof does keep some of them off the pavement! I’ve taken to bumping up the kerb onto the ‘ramp’ up to the service road. You have to watch out for cars and vans but they’re going slower than the ones on the main road. The annoying thing about this is it’s at the edge of the empty Shawfield (or Magenta?) site but hasn’t been connected to the path to the Smart Bridge. 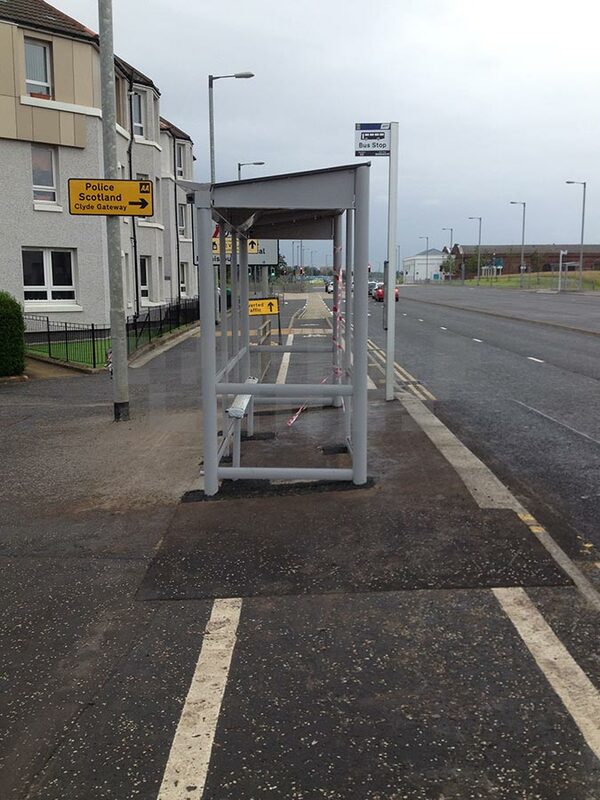 South Lanarkshire Council have got better at bus stops – they did a few bypass ones on Hamilton Road in Cambuslang. Sadly, they’re isolated examples, not part of a protected bike path like the South West City Way. This contraflow cycle lane is very well used in peak time. When I take the bike, it’s part of my commute to Central Station. I occasionally use it at other times to get across to the West City Way on Waterloo Street. No matter what time of day, you can pretty much guarantee someone will step out in front of you or stop just before they do. I don’t really blame them – the council haven’t followed the guidelines here. Although it may seem obvious in the photo it really isn’t. Even a different colour of paving stone would have helped. I do however blame people for the dirty looks I get when I ring my bell, say “excuse me”, etc. The other hazard here is oncoming traffic, especially HGVs, can encroach into the lane when they overtake parked cars. Update: Some white paint has since appeared to mark this lane – a dashed line. I don’t know if GCC saw this post but at least the lane is slightly more visible now. Tollcross Park – simply throw your bike, wheelchair or pram over the gate! 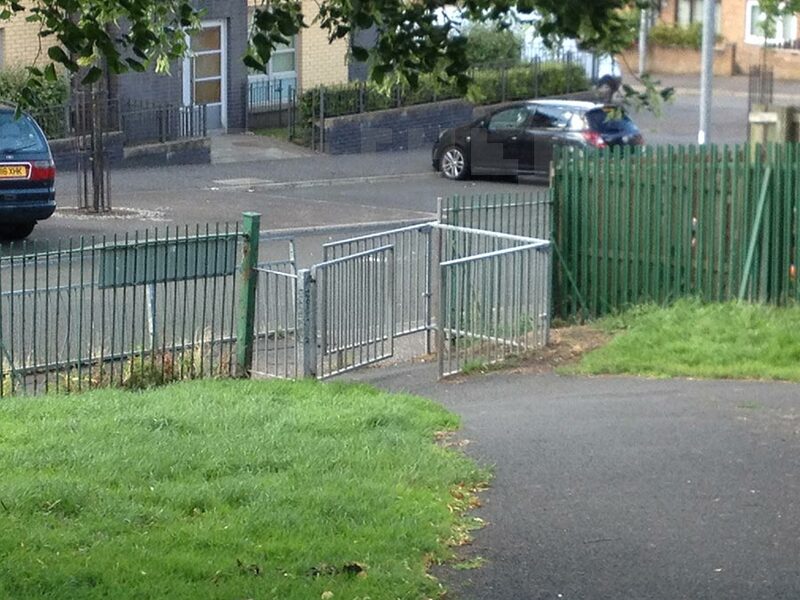 Parks can be a refuge for cycling but some barriers still exist – literally in some cases. Tollcross Park, in the East End of Glasgow, has one gate that’s impossible to get most bikes through. I know it’s probably to slow people down and prevent motorbikes entering the park but it doesn’t – there are half a dozen other entrances without a gate. It also prevents people with buggies/prams or wheelchairs from getting through (which goes against the Disability Discrimination Act). A similar example is the entrance to the covered walkway at the SECC. I’m still shaking my head at The Grauniad including this bridge in a list of top cycling infrastructure. It’s about as hazardous as it is useful. The gates are clearly meant to slow down people coming down the ramp. However, they’re so close together that they make it very difficult to go up into the damn thing. Crowds and the blind corner in the middle of the bridge make it frustrating to use. I don’t mean to pick on Glasgow City Council for this one. 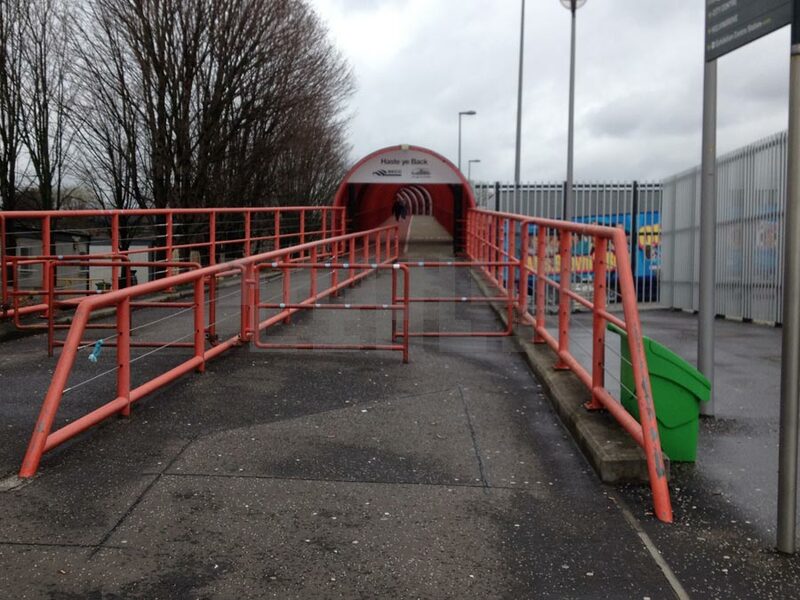 Special mention should go to North Lanarkshire Council for the gates they’ve put all over Broadwood in Cumbernauld. Last time I was there was on a group ride so I didn’t have time to hang about taking photos. This narrow path along the Broomielaw is probably one of the more widely known examples. I know many people avoid it by cycling on the road. However, it’s near one of the most popular Nextbike hire stations at the ‘Squiggly’ Bridge so it needs an off-road path. The reason it’s so narrow is because of Clydeport’s car park on the other side of the wall. I guess it’s a hangover from when the Clyde had working docks. The red tarmac on the left of the photo is the start of the ‘Fastlink’ bus lane. It was supposed to be a South American-style Bus Rapid Transit system with 40mph buses. They were few and far between – then the Fastlink buses repeatedly knocked people down and the lanes were closed. The above path wouldn’t be an issue if one change was made to the route further east at the King George V bridge. The steps in the photo stop you cycling this part. It’s a shame as the path is relatively wide at this point. In the background of the photo, on the right, you can just see the metal gangway ramp down to the pontoon for the Water Bus. Parts of the walkway jut out in the middle and the foreground. 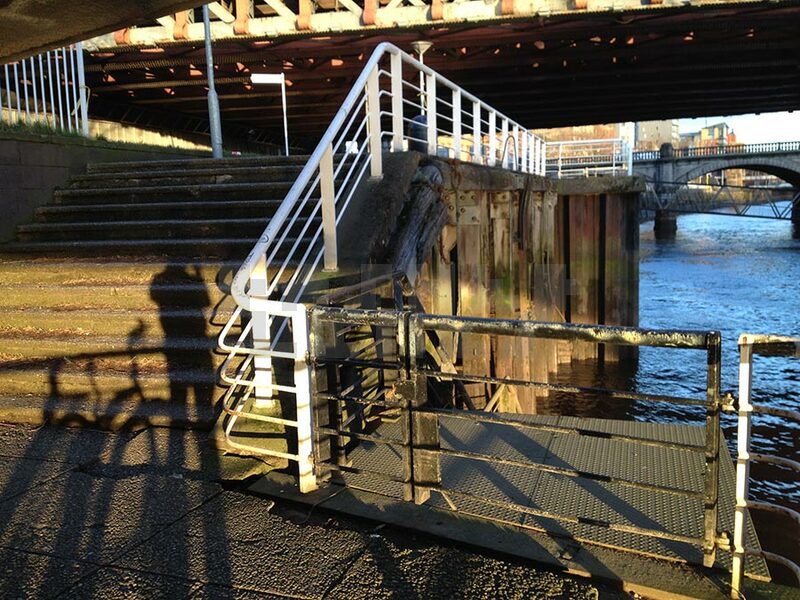 The latter even has a gate (I realise it leads to steps down to the water). I’m sure it would cost money and there’d be a lot of forms to fill in but it does seem like this section could have a ramp. That would bypass the narrow part of the Broomielaw, the casino and a road crossing. You might assume that Scotland’s tourist routes would have a higher standard. If so, Balloch near Loch Lomond would be a prime location. Its retail centre, Lomond Shores, is between Balloch train station and the loch on the edge of a national park. The photo shows a lane which puts you between two hedges into the path of turning cars. I guess having any cycle lanes at all is more progressive than most retail parks. However, there’s a park and the pedestrianised ‘street’ which could be a traffic free route. So it’s a shame that Lomond Shores choose to routes bikes through the car park. No round-up of duff cycle paths would be complete without an appearance from this sign. This one is in Hamilton at the top of Muir Street. It stops at a car wash where cars would turn across you to the left. To be fair, most people would cycle through Strathclyde Park to get down the hill anyway. However, a route to Montrose Crescent (across the road in the background) would be useful. I think the fence on the central reservation is from when Holy Cross High School was on this street. It was either a road safety measure or a vain attempt to keep the kids out the chippy! These days they wander across Palace Grounds Road to the drive-thrus. Notice the ‘give way’ marking is on the right of the pavement instead of the left. 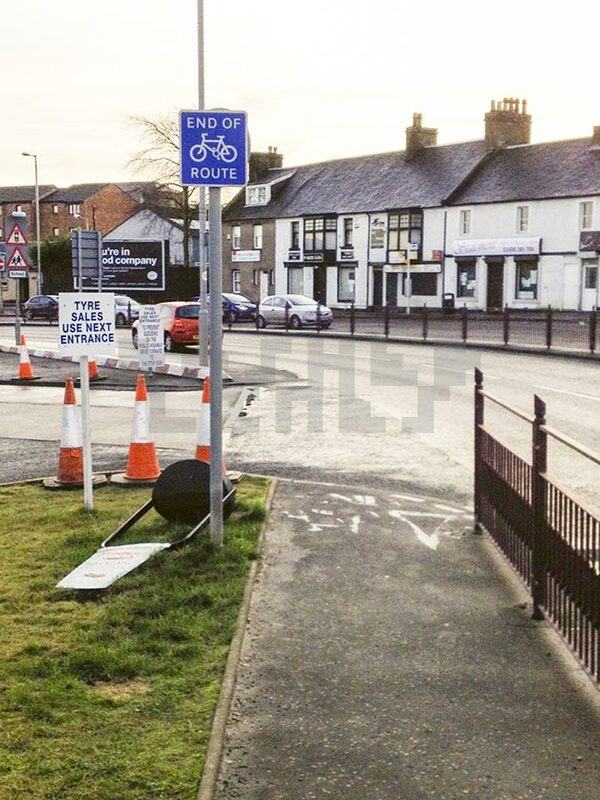 It’s a small detail but it’s also about as ‘Continental’ as cycle paths get in most towns in Scotland – more’s the pity. Never mind about towns, you should try the cycle lanes in the vast Scottish countryside. But there aren’t any. I say, double the cost of petrol and people would drastically cut their mileage. Heck, they might even walk places, like in the old days! Or cycle!! And then they’d want loads of proper cycle lanes! Thanks for that. It’s probably true in a lot of places. The only rural area I can think of that has a proper network of cycle paths is Clackmannanshire. Judging by the rate of progress in cities and towns, you would need something drastic to change. I think many ‘Escape to the Country’ types may already feel like that about petrol – one for OPEC, perhaps!? You mention The Shields road cycle path. Just south of the weak bridge they’ve created a new road into a new industrial park. It has give way markings on both sides of the cycle track and the cycle track is painted green. Last friday the inevitable happened. A car was straddling the cycle track trying to force his way into the queue which always forms. A cyclist choose to go round the front of the car, he didn’t see her (or look). He pulled away and she ended up on his bonnet. The bike’s from wheel was buckled, and the chain guard wrecked and the rider was bruised. The driver left the scene saying it wasn’t his fault. The real issue is that this is a shocking piece of design. The volume of traffic there means that anyone wanting to leave the industrial park is going to struggle not to sit on the bike lane. Anyone know if there is a mechanism for complaint? Is that road just at the south end of bridge on east side of Shields Rd? That incident sounds quite bad. The woman involved could’ve reported it on 101 but police aren’t always interested. In terms of road layout it would probably fall under Land & Environmental Services dept in Glasgow City Council. You could try GCC’s contact page or their switchboard. Side roads onto cycle lanes seems to be a weakness in most of the UK. Some European countries make the lane and pavement continuous by raising them above road level (so it acts like a speed bump). However, that wouldn’t help with cars encroaching. Dutch guidelines would probably move the cycle lane closer to the industrial estate so it left a car length between the lane and the road (for a car to wait in). Not sure how that would work with the wall in this case. 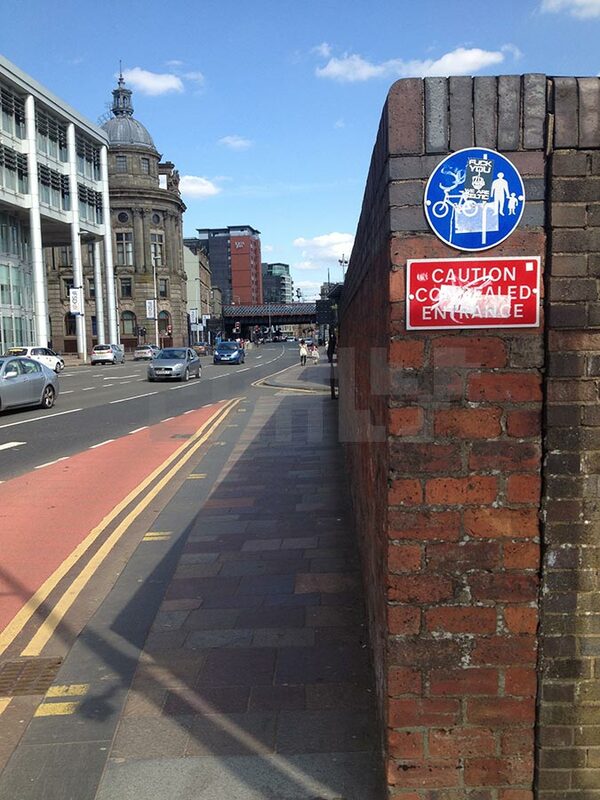 Folk on the City Cycling Glasgow forum might know more. I know there have been other issues, like gritting, but the South West City Way is still better than most infrastructure in Glasgow. Hopefully, South City Way on Victoria Rd will improve on it. Yes, on the East side of the road. I followed your link to the council and made a comment.